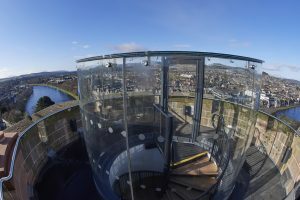 The Castle Viewpoint visitor attraction in Inverness offers fabulous 360 degree views of the Highland Capital and the surrounding scenery. Enjoy the narrated drone footage that provides a birds-eye perspective of the City, and highlights many of the interesting landmarks to look for from the viewing platform. Climb the tower to find out more about some of the intriguing myths and legends associated with the City. Discover the tale of the Brahan Seer, the legendary 17th century Highland mystic who made many a prediction that came to pass, and learn how St Columba met and banished a monster from the River Ness, could this have been the first sighting of Nessie, the Loch Ness Monster? Finally, take in the spectacular vista looking out across the city of Inverness and beyond, from our fantastic viewing platform. Please note due to the historic nature of the building there is no wheelchair access above the ground floor.